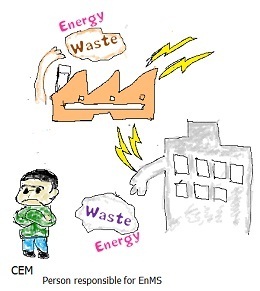 ISO 50001 protects CEM or person responsible for energy management system (EnMS) from becoming isolated situation in the organisation...ISO 50001 eliminates ISO-lation!! Many energy user organizations do not recognise that their EnMS operation not moving as swiftly as they expected is caused by CEM or person responsible for EnMS facing isolation in their organisation. Why? Many organisations appoint their CEM or person responsible for EnMS from engineering staff from an organisation responsible for facilities supplying energy, and their prime role and responsibility are to supply enough egergy to the energy users so that the operation can go on. As the same as “supplier and customer” relationship in our daily life, typical business operations have the relationship of “energy supplying organisation” (supplier) and “energy using organisation” (customer) in their operation. There truly exist “supplier and customer” relationship. The consequence is unless having a strong support from the management team of the “energy using organisation”, often cases CEMs or persons responsible for EnMS are forced to take a polite position before they fully perform to their ability. This is where ISO 50001 becomes very effective since the standard first addresses that the top of the organisation to understand the essence of EnMS and lead the system (4.2 “Management responsibility”). Then a management representative is to take the role of leading the EnMS operation (4.2.2 “Management representative”). After identifying roles and responsibilities, and planned actions are implemented, the key PDCA procedure item is to have management review in order for the top management to evaluate the progress and to provide necessary resources and authoritative support ensuring the objectives and targets achieved (4.7 “Management review”). These key top management involvements allow CEMs or persons responsible for EnMS to concentrate in the core of energy performance improvement activities that are defined in the rest of the ISO 50001 clause 4 “Energy management system requirements”. ISO 50001 has been designed to eliminate CEMs or persons responsible for EnMS facing isolation, and to output result to their fullest ability. ISO 50001 is to eliminate isolation that weakens the participation of entire work force and the teamwork that are vital elements to ensure the proper operation of EnMS.